Birthday 46: The Food So Far « Midlife Crisis Crossover! 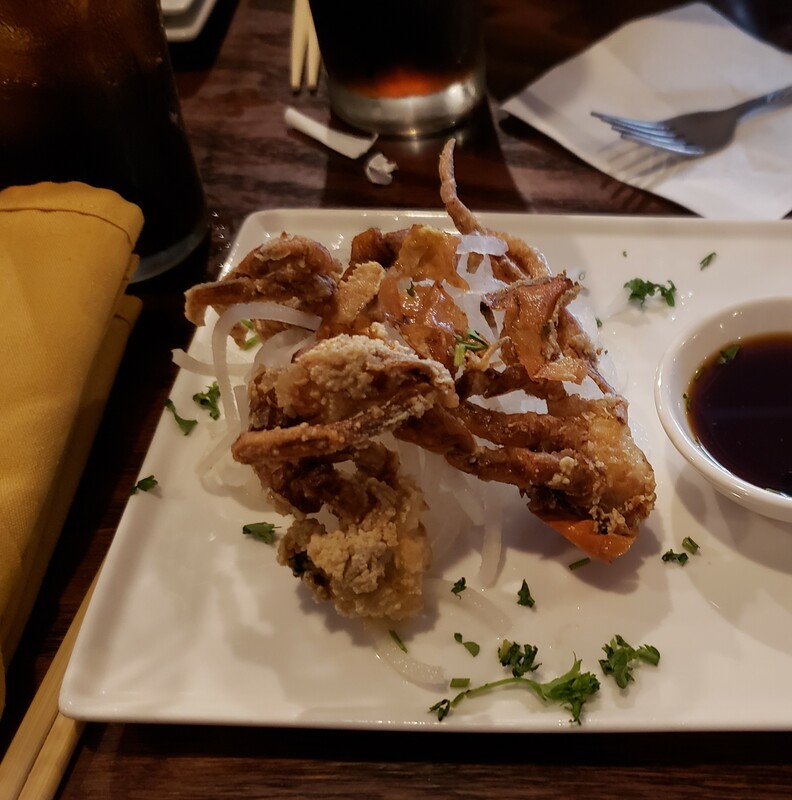 Soft shell crab appetizer, delicately fried and served on a tiny bed of rice noodles with a side of ponzu sauce for dippin’. We would’ve loved an extra pound of these. Tegry Bistro has three locations in the central Indiana area — one in the northeast upscale region; one in a smaller town to the west that I’d say is a surprising choice, and one on Indianapolis’ northwest side, across the street from an AMC theater we used to visit frequently till they decided that assigned seating is a perk. That Tegry Bistro is small and easy to overlook, nestled between a Cold Stone Creamery an the Ted’s Montana Grill that Anne and I visited for our twelfth anniversary. It’s turned up in our past search results for untried restaurants in that vicinity but never caught our eye until I stared at the Google Maps results a bit more intensely this time. At last, it was Tegry’s turn. Shrimp tempura curry, leavened with potatoes and packed with spices that built up steam as I dug more deeply into the bowl. Service was a bit slow because only one waitress appeared to be on duty, but she was extremely pleasant and quite accommodating for a party of four who’d never been there before. We had to coach my mom on the various Asian-influenced choices, then spend many minutes letting our eyes glaze at the sushi menu with its dozens of offered varieties. 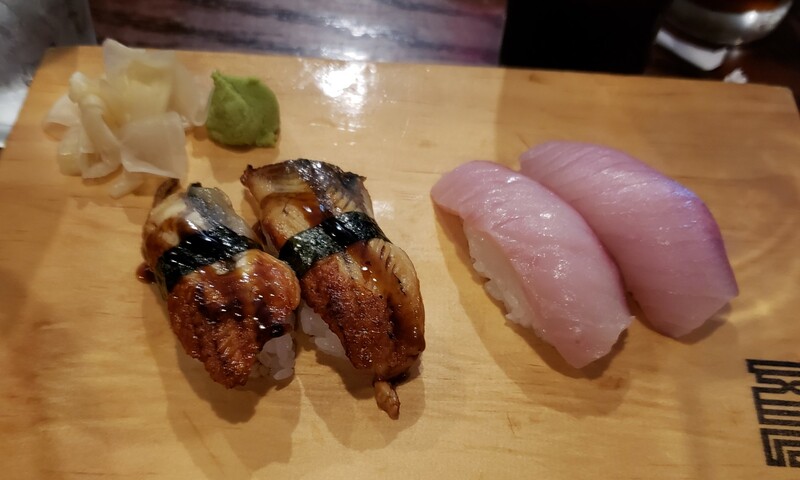 Sadly they were out of urchin — the first weird kind that caught my eye — but my son and I were fine with our eventual choices of eel (at left in the photo) and hamachi (a.k.a. yellowtail — purportedly a gourmet favorite according to Chopped). Maybe it’s the wrong answer in some circles, but my son and I both preferred the eel sushi. As usual, we had mixed reactions to the encouraged use of chopsticks. My son has them mastered and has to give us a refresher course every time. 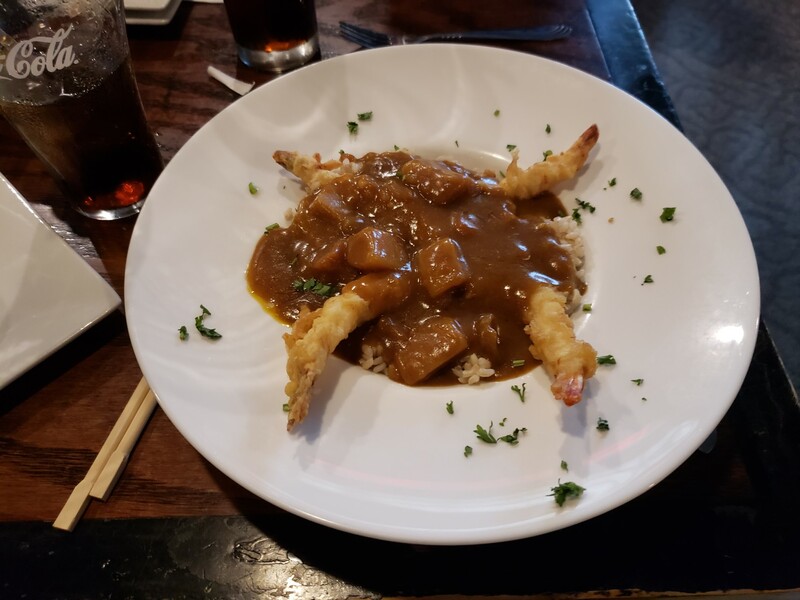 As usual I stuck with them longer than Anne did, until I realized the curry rice wasn’t clumpy and didn’t lend itself to being plucked. My mom gave up instantly and went straight for the courtesy fork pile. No shaming occurred. We understood. As far as meals not pictured, I could tell the steak teriyaki was a big hit when my son and my mom both finished their entire portions. I can also couch for Anne’s chicken with yakisoba noodles, because her leftovers became my Friday lunch. Selfishly speaking, I secretly wish she’d had less of an appetite and left more of them for me. Curiously and without explanation, their dessert menu is mostly Italian, apart from a couple of classic Japanese ice creams. Green tea is okay, but red bean ice cream is among the most underrated ice creams out there. 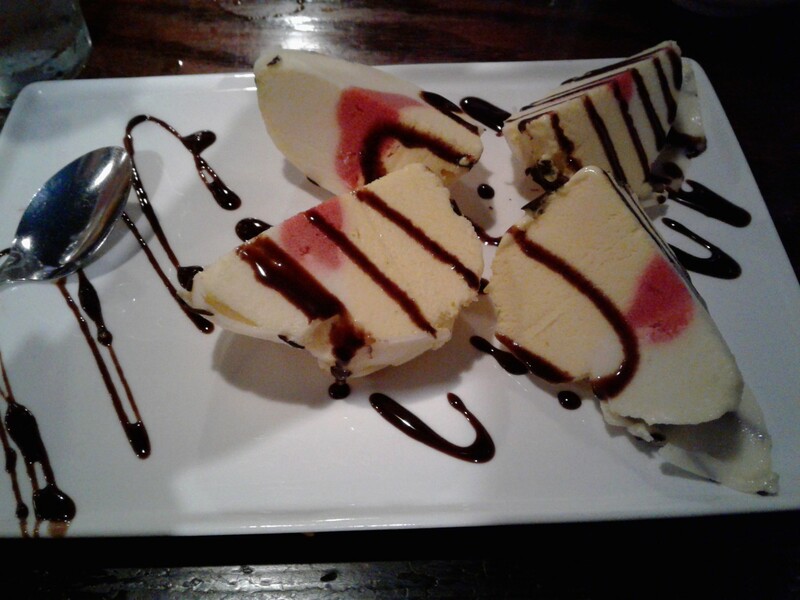 Instead, though, we went Italian all the way on dessert. Anne tried their “Exotic Bomba” — mango ice cream (or maybe gelato?) with a passion fruit center and festooned with chocolate ganache. Since fruit in involved, that means technically this is health food and Anne is thinner now. 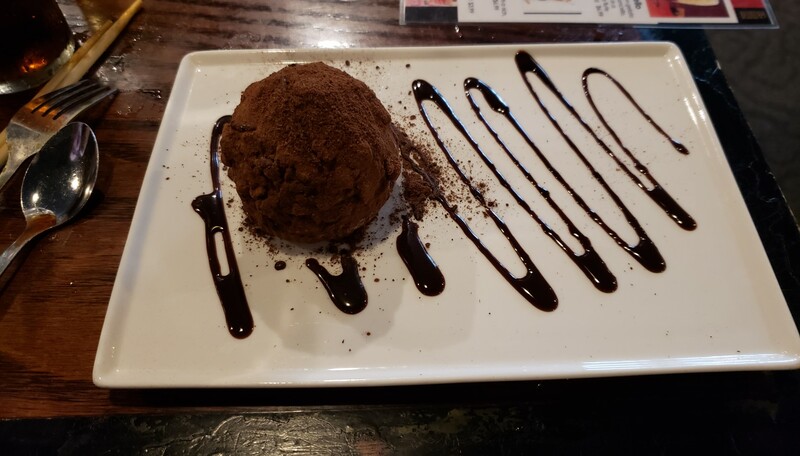 The rest of us tried the chocolate tartufo — a sort of chocolate ice cream ball with a Zabaglione cream center, covered in chocolate hazelnut powder. Glorious and portioned just right. On a related note, Nutella Powder should be a thing they sell in stores that you can mix into your milk. A fine time was had by all, especially a relief to the pickier eaters among us who were unsure at first. The time spent with family was probably the best way to celebrate, as I was given no reasons whatsoever to start shouting at them “WOE IS ME!” and bemoaning how many famous people are half my age and fifty times more accomplished. I’ll save that tantrum for the weekend, and then procrastinate it, and then stifle it, and then get right back to being pretty okay with age 46. Thank the Lord for another year of not doing anything monumentally, ostentatiously immature or self-destructive. Unless that sinful tartufo counts.